Social media: a victim of their own success? This is the English version of my article and blog post in German. Today many libraries have a presence on social networks, primarily with a Facebook page. But there are signs of a certain disillusionment about the benefits of activities in social media. This article shows that it is not done with the mere presence on Facebook. I must start by saying that I am an intensive user of social media for several years. The list of platforms on which I am present, is quite long and includes services that I use regularly such as Facebook, Twitter, LinkedIn, SlideShare or Foursquare, and rarely used platforms such as Google+, Youtube, Flickr, LibraryThing, Diaspora and some more. And obviously I run a blog too. In my time as responsible for social media marketing at the ETH-Bibliothek I’ve brought this library to Facebook, Twitter, Foursquare and Google+. I am still convinced that these are important steps towards the opening of the library for new trends and increased interaction with their customers. 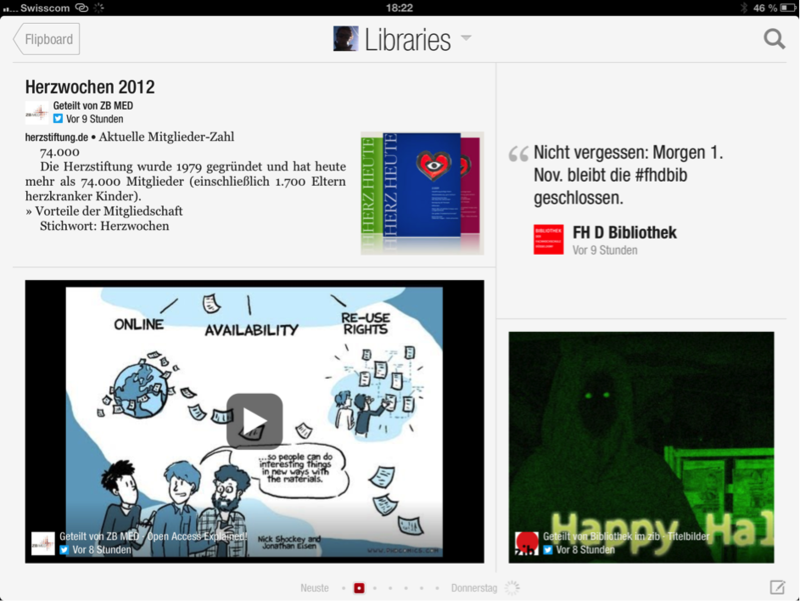 But in this post I want to give a more critical view on the activities of libraries in social networks. There are increasing signs that social media are becoming a victim of their own success and that the objectives of the engagement aren’t achieved. Nevertheless social media, especially Facebook, have arrived in libraries: a study led for a bachelor thesis at the University of Applied Sciences HTW Chur, showed that in spring of 2012 271 Swiss libraries were present on social media. Be honest: When was the last time you received some really useful information on Facebook? 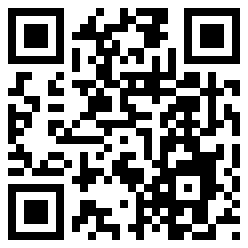 OK, on 31 October 2012 I read on Facebook that the virtual city tour of the Max Frisch Archives is now online. 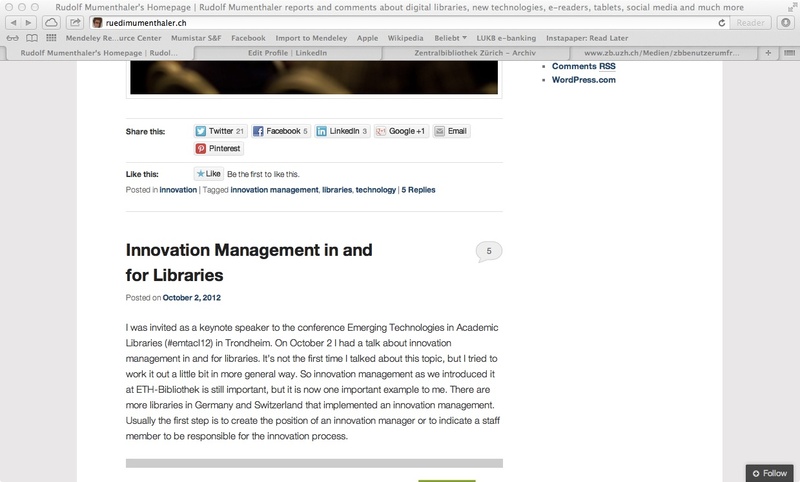 That was interesting to me, and I liked the post of the ETH-Bibliothek. But that was a single highlight. Facebook is likely to be overflown with spam. Even if you have adjusted your profile to see only relevant information of certain „friends“, silly fun photos that are liked by friends of friends, appear prominent among news. The automated process in the background makes it unclear to me, which posts I get to see at all. Especially among young people, this is a key reason why a certain exodus from Facebook takes place. In addition Facebook is no longer „cool“, if even grandmother and grandfather have created a Facebook profile in order to be informed about the activities of their granddaughters and grandsons and if every club, every company and every library has a Facebook page. Anyone who thinks he can get the attention of young people with a simple Facebook presence is to be mistaken. It is difficult to obtain precise information about the demographic profile of Facebook fans. My experiments with the profile of the ETH-Bibliothek have given clear indications that not primarily students from ETH Zurich are addressed. Most of the fans belong to the community of librarians, mainly from Germany. Of course the German colleagues are also welcome – but they are not the real target audience of the library’s Facebook activities. In 2011 the ETH-Bibliothek conducted a poll among its users that are not members of the faculty. 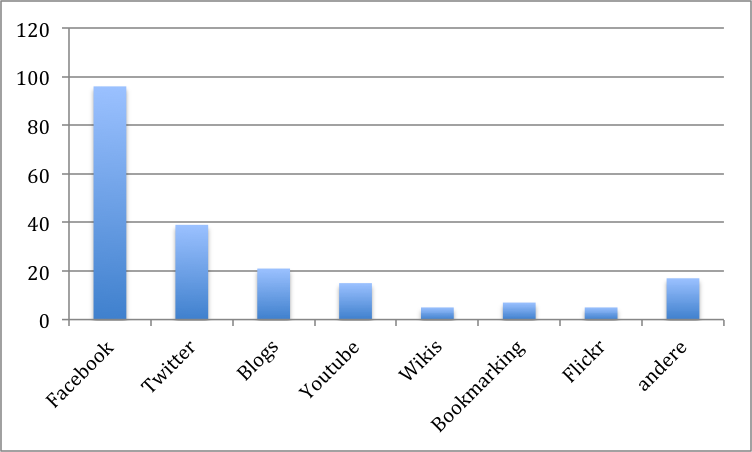 It showed that hardly anyone knows about the presence of the library on social media. But this is not as bad as most say that this presence is in general not important. We can say that with the Facebook presence hardly the actual target groups and the actual customers of a university library are addressed. I assume that it is similar in public libraries. If a library wants to address its target groups, it has to organize events and to perform exciting activities. Although young people hardly come out as a fan of a library, you can address them with original promotions and offers. A poetry slam event with students promoted on Facebook attracts more fans or likers than the mere presence of the library. This means in practice that it is not enough, to automatically publish the news feed also on Facebook. But you have to manage this presence and to come up with compelling content for the intended audience’s needs. Then Facebook is just one part of the marketing mix to send invitations for a real event, or to draw attention to this event. I like Twitter. It’s a brilliant tool for real-time global and simultaneously distributed information. 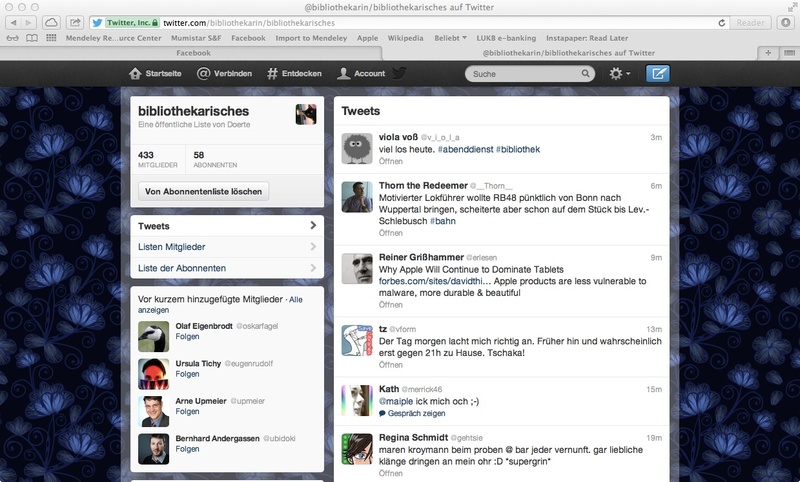 Thanks to Twitter, we learn about events or new products long before official publications report about it. Twitter is a really useful news ticker, which condenses the information from countless blogs and makes it available as a short text message. But Twitter only works in real time. This soon becomes a problem if you – like me – follow hundreds of Twitter feeds. The messages come in literally every minute. You may organize your feeds into lists and track them separately with the appropriate tools. But I am flooded with Twitter messages as soon as I look away for a few hours. And that happens to me more and more lately. Posts from libraries get lost in the large amount of information. A great feature is the search and subscription to hash tags to follow for example the discussions on conferences. But it happens quite often that spam bots detect a conference hashtag and spread their spam with this suffix (e.g. #bibtag12) to all conference Twitterers. The responsibility for organizing the tweets lies with the users and not with the library. A Twitter user can compile a list of libraries or follow an existing list to pursue the tweets from libraries. And you know who makes this effort creating lists? Right! Librarians. Thus also on Twitter, the basic problem is that usually the community of librarians follows the news from other libraries, but hardly the users of libraries. As an information source for librarians I find Twitter incredibly important. And it’s really great to read these lists with the app Flipboard on the iPad (or on another tablet) so that you can scroll as in a commercial magazine. But Twitter is less fitted to spread information about the library directly to customers. What about other social media and its benefits for libraries? Foursquare has the aspect of a respectable, location-related information. But it is largely used as an interactive game to tell friends where you are and to win points in order to become Mayor of a venue. Google+ can also be used for business (and library) purposes. The user group is rather straightforward. Google+ has the somewhat underestimated advantage that you can publish longer posts on a social network and to foster a discussion. Its qualities Google+ demonstrated in the legal case of scientific publishers vs. the electronic document delivery service of the ETH-Bibliothek. While Twitter was used to spread the news, it was hardly commented and almost unnoticed on Facebook. But on Google+ was an intense discussion about the background of the case, initiated by a user. There were 30 people involved in this discussion, which was shared 104 times and provided 148 times with a plus. However, this interaction was not taken on the profile of the ETH-Bibliothek but on the page of a user who had previously published the article on his blog. This leads us to a classic social media, the good old blog. Blogs unite all central features of a social medium in themselves. They still form the backbone of the Web 2.0, the „interactive web“. Here, every one who thinks he has something to say, can do so quickly and easily, and – potentially at least – communicate it to the world. The readers get the opportunity to write comments in a simple way. And blog platforms offer the function to share the posts on all kinds of social networks. The example below shows a blog post with five comments (in the speech bubble) and the buttons for sharing on Twitter (21 times), on Facebook (5 times), on LinkedIn (3 times) and on Google+ (never). Substantial in this example were the comments that deepened a debate that has been started at a conference. Twitter is very well suited to diffuse this content broadly. Facebook, however, is too superficial for an in depth analysis of the content. With a „like“ it is not done in a scientific or technical discussion. So blogs are the real platform to publish relevant content and to interact with users and to discuss. Social networks then offer channels through which the content can be distributed broadly to different target groups. As a conclusion we can say that social media play a very important role as part of a communications and marketing concept of a library. But we must not expect miracles from social networks. And one should also not sit back in the belief that with a presence on Facebook the library already reached the level of an innovative, modern institution that interacts with its customers. At first you have to create content and to perform exciting activities, which you can – in a second step – spread through different channels to your target groups. Mizeva, Tatjana: Interaktion Deutschschweizer Bibliotheken mit ihren Kunden über soziale Medien, Chur 2012 (unpublished Bachelor-Thesis). Who checks in the most at a venu can become mayor of this place. And the user wins points with every check-in, that can be compered with friends. And of course, you can see where your friends checked in and left comments. Mumenthaler, R. (2012). Soziale Medien an der ETH-Bibliothek – ein Zwischenbericht drei Jahre nach der Einführung. In: B.I.T.online, 15 (2), S.137–140. Social media can often be fabulous but most of the time results are few and far between. SM are an excellent avenue for discovery. As it becomes harder and harder to reach your audience through social media, creating useful and relevant content is still the most important factor in the equation. CONTENT is STILL KING! Vorheriger Beitrag Vorheriger Beitrag: Soziale Medien: ein Opfer ihres Erfolgs?